Chances are you won't find a single loaf of bread in the break room at the Sprouts grocery store in Katy, Texas. They have dropped pants sizes and gained endless energy, by cheering each other on, sharing recipes and finding new keto-friendly products in the store, they said. Chris Martinez, Nick Glidden, Ana Lewis, Farley Hayes and Micha Govella from Sprouts Farmer's Market in Katy, Texas, have lost a combined more than 200 pounds. “It’s almost like an Easter egg hunt in the store every day,” store manager Nick Glidden, who's down 35 pounds, said about looking for keto-friendly products. "Morale is up. Everyone is trying to help." Glidden changed his diet after seeing the success that grocery manager Farley Hayes was having. 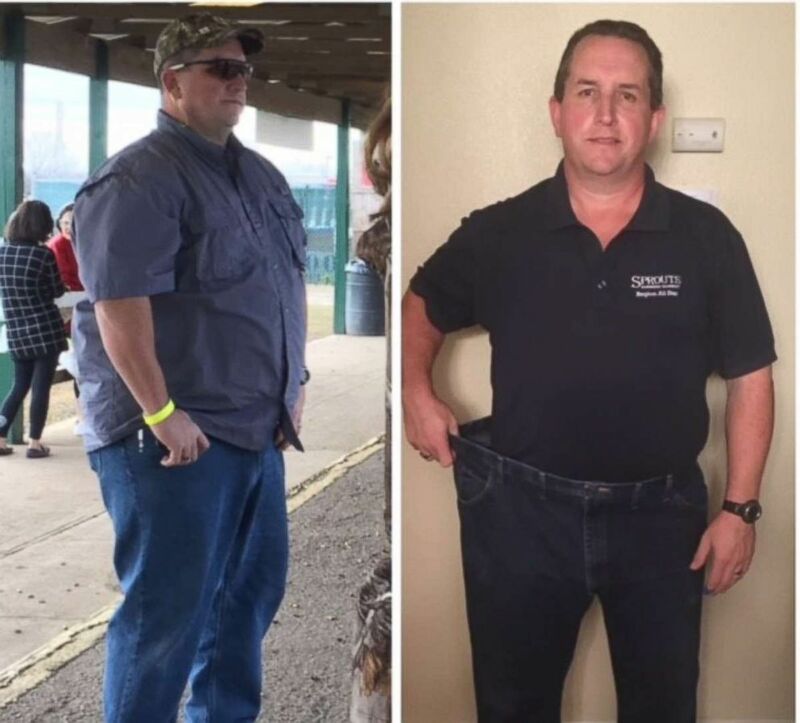 He was down 65 pounds. Sprouts employee Farley Hayes is pictured before and after his weight loss. 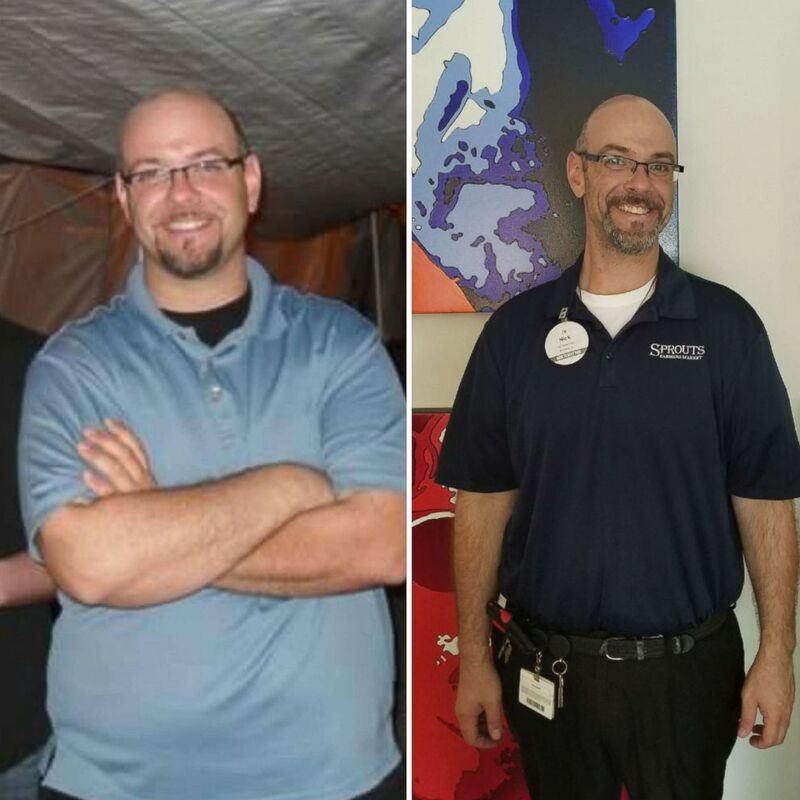 Hayes, who started the diet at around 350 pounds, found himself choosing food out of convenience, without a thought toward how it would affect his health — he often ate lots of pasta, bread and fast food. He now reserves one afternoon or evening a week to prepare food, and when he finds good recipes or food items, he brings them into work to share with his coworkers. The ketogenic diet was developed in the 1920s as a treatment for epilepsy. Physicians noticed that by mimicking the metabolism of fasting, they could reduce seizures. When it comes to the keto diet, fasting is meant to push your body into a state of ketosis, where there's such a low amount of carbohydrates in the body — its primary source of energy — that it resorts to burning fat for energy. Keto dieters typically cut carbohydrates to about 10 percent of their daily diet, which in some cases can be just 20 grams of carbohydrates per day, or the equivalent of about one slice of white bread. The diet’s proponents say that it is the best way to lose weight without feeling hungry and that it increases energy levels. 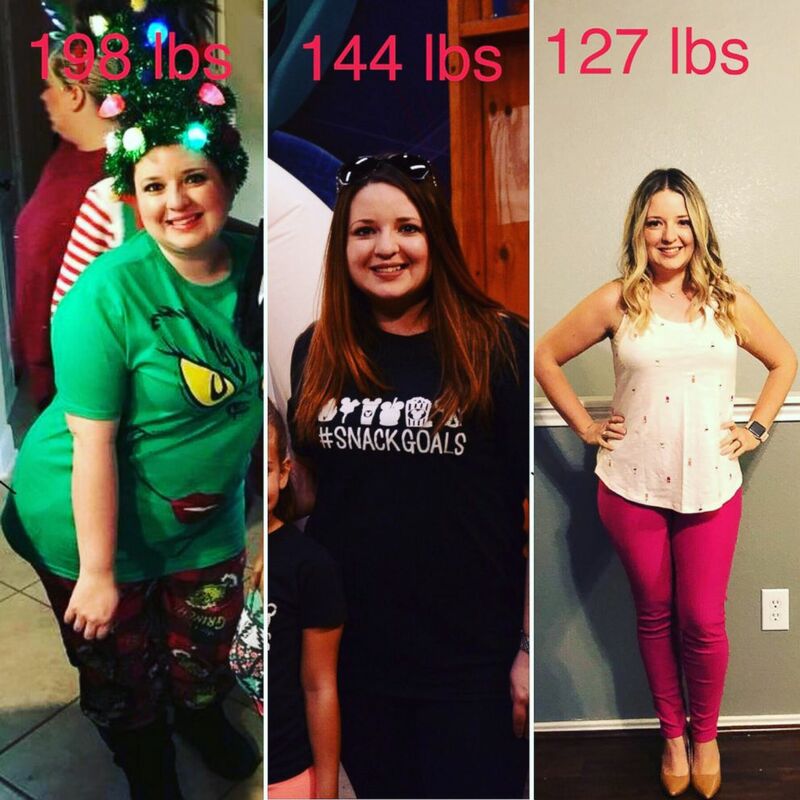 Ana Lewis, another member of the weight-loss five, which some dubbed the “Keto Krew,” said she has experienced the reported benefits of the keto diet. Sprouts employee Ana Lewis has lost more than 70 pounds. Lewis, down nearly 75 pounds since May, went from eating rice every day to now having a protein (like meat or fish) and a green vegetable for dinner each night. 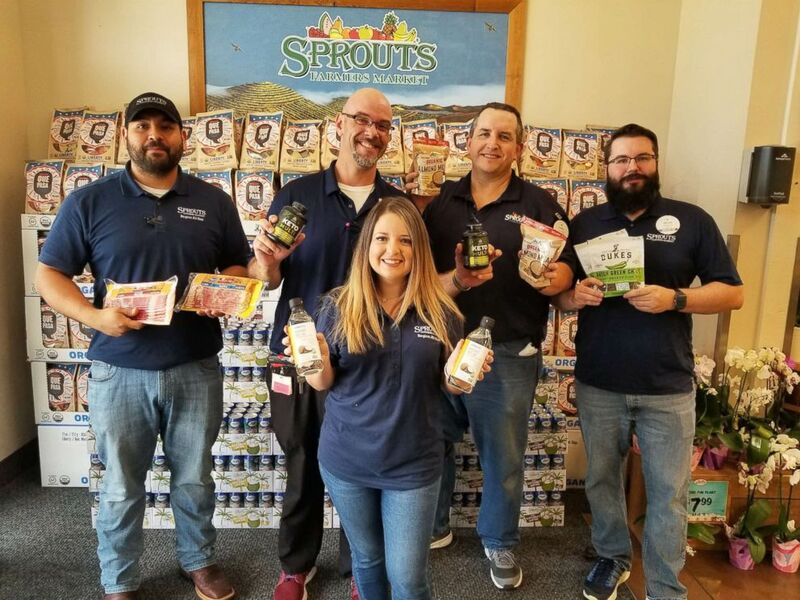 The "Keto Krew's" weight loss was discovered by Sprouts officials in the grocery chain's Arizona headquarters through its Healthy Living Heroes program, which encourages team members to share how working at Sprouts has inspired them to make a change in their habits. "When I have guests asking for certain [keto] information, I can say, 'Let me take you to the star of the building,' and take them to Farley or take them to Ana, 'the keto queen,'" Glidden said. "It's nice to work for a company that supports healthier decisions and [a healthier] lifestyle, and is working hard to provide even more support." Although Glidden admits he was sold on the diet as soon as his coworker, Hayes, said the word bacon, he and other "Keto Krew" members all acknowledged the keto diet isn't just feasting on meat and cheese. "You could easily be consuming 3,000 calories on the keto diet, so you do have to be aware," Glidden said. "It’s all about the balance of fat, protein and carbohydrates. A little more fat than protein and each of us has a set number of carbs that we try not to go over each day." The key to being successful on the keto diet is getting about 20 percent of your calories from protein and eating lots of fat. The amount of fat someone following the keto diet may consume in one day could be more than five times the recommended intake for daily fat for the average American, according to Maya Feller, a New York City-based registered dietitian. But Feller stresses that those fats should come from healthy fat food sources, such as olive oil and nuts. "When I see people who are living the keto lifestyle, it’s rarely people who are eating fatty foods and doing nothing," she said. "They’re trying to keep themselves in ketosis and doing things like eating chicken and fish, they’re actually paying attention." Feller recommends people who want to start on the keto diet talk beforehand with a qualified healthcare practitioner to make sure the keto diet is safe for them and that they are correctly adjusting their macronutrients -- protein, carbs and fat. "You have to have a real understanding of what that means in the context of your day and the context of what you have been eating," she said. Critics of the keto diet argue that it is nearly impossible to follow for a long period of time, and that it could lead to muscle loss or deprive the brain of its preferred fuel source: carbs. Additionally, they argue that the majority of the research on the keto diet has not yet looked at the long-term effects it has on non-epileptic people over the course of 15 to 20 years. If you are committed to trying the keto diet, Feller recommends making sure you get blood work done regularly, particularly a lipid profile. However, she warns, "If we're talking about the majority of the country, [the keto diet] is not indicated and it's not going to be adhered to properly, and [it] is not sustainable. It's not ever my first-line recommendation." People who want to make a change in their health should take a look at what they're eating and their dietary patterns, and then make modifications that are sustainable, Feller said, noting that dietitians are there to help.